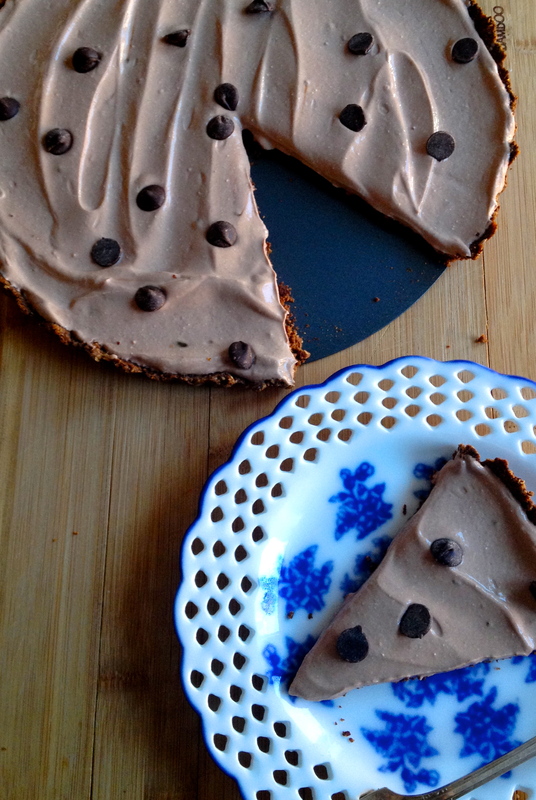 Creamy Chocolate-Coffee Tart with an Almond Crust. Yogurt is good. Chocolate is good. Coffee is good. Almonds are good. Chocolate is really good. So naturally, this recipe is good. The buttery almond crust is like the delicious nutty cousin of your standard graham cracker crust, but it’s much easier on us carb-avoiders and any gluten-free peeps among us. And the creamy chocolate-coffee filling is just sweet and decadent enough, without going sugar-overboard. It’s a quick and easy road to creamy nutty goodness. I like to give it a sprinkling of chocolate chips, but it would be pretty groovy to drizzle some melted chocolate over the top and really up that glamor factor. NOTE: This isn’t a good dessert to make far in advance. It will last in the fridge about 36 hours before the yogurt starts to dry out from air exposure. The good news is, it doesn’t take long to make, but if you need to do some prep ahead of time, make and bake the crust and keep it in the fridge. 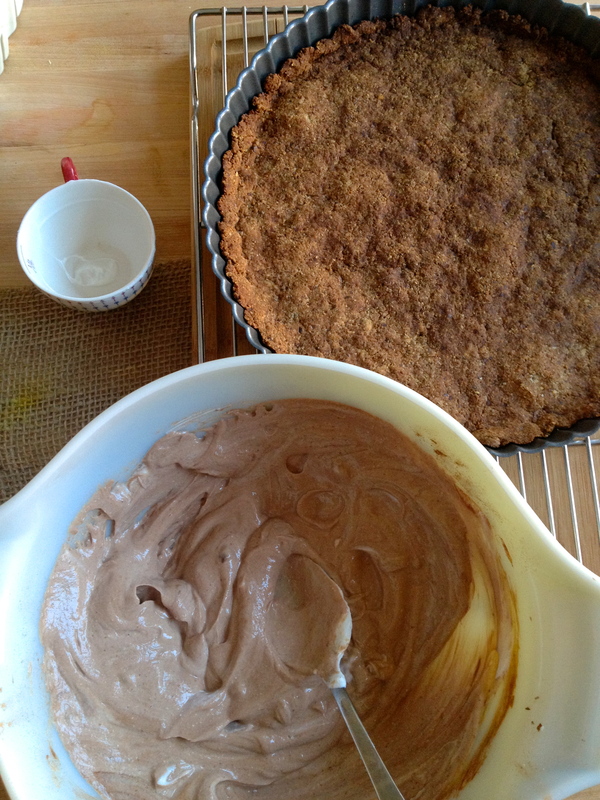 Then, a few hours before you’ll need it, mix up the filling and assemble the tart. Stir honey into melted butter. In a mixing bowl, combine butter and honey with almonds, salt, and cinnamon. Press into a tart shell or pie dish. Bake for 15-20 minutes, until it’s a medium brown color. I would tell you to wait for it to be “golden brown,” but it’s pretty much golden brown before it even starts cooking. If it starts to brown too quickly (mine did), tent the crust with tinfoil to protect it from burning. When the crust is done, remove it from the oven and let it cool at least half an hour. While the crust cools, prepare the filling. Dissolve the coffee granules in the hot water. Stir together the Greek yogurt, coffee, cocoa powder, and brown sugar. Keep it in the fridge until the crust has cooled. Once the crust is cooled, spread the yogurt filling evenly over it. Sprinkle with chocolate chips and dig in! Previous Sweet Coconut Milk Bars. Next Chicken, White Bean, and Brussels Sprouts Salad. This looks so delectable, and I love how it’s much healthier than a typical dessert! Thanks for sharing! This looks so decadent! 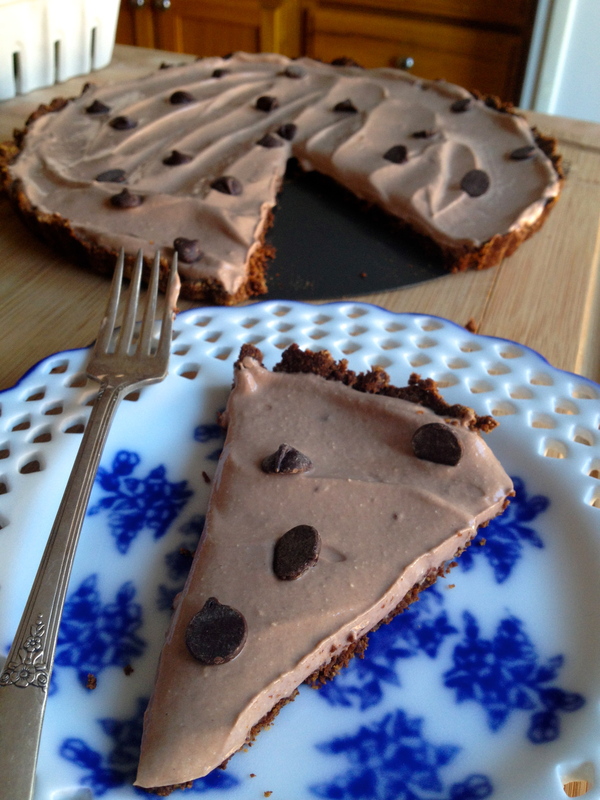 I think I might have to try a version of this without dairy…yum! And beautiful presentation. It looks gorgeous! I love the combo! Thanks :) I love any excuse to use a tart shell! Wow those are all my favorite flavors! Looks great and bet it even tastes better! Right?! Chocolate and coffee should always be together. And buttery almonds…..yes.